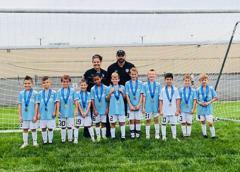 Pasadena Soccer Club promotes a healthy youth-soccer environment that enables each player to fulfill their potential both on and off the field. This year the scholarship fund will be giving away TEN (10) $2,000.00 Scholarships to graduating seniors. Describe how you demonstrated leadership ability in your school, work, community, or soccer organization. Describe a special attribute or accomplishment that sets you apart. Minimum of a thousand (1000) words. Must be typed in double spaced, not hand written. Grammar, spelling, and content will count toward your final score. Must be in PDF format or word document that can be formatted to PDF. No references to your name can be included in the essay. Coaches or parents if you have pictures or accomplishments that you would like to share with the Club and on PSC's website, please send the info/ picture HERE. Pasadena Soccer Club was awarded the Organization of the Year award from the Anne Arundel County Department of Recreation and Parks. Pasadena Soccer Club was awarded the Organization of the Year award from the Anne Arundel County Department of Recreation and Parks. Thanks go out to all of the volunteers, parents and players that made this award possible. GREAT JOB THIS FALL TO OUR PSC TEAMS! *PSC Shooting Stars GU11/2008 D1 Team. This scrappy pack of girls won their league in their first official season as a team in D1! 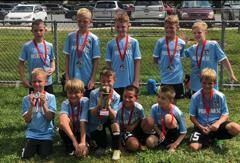 - The Boys were Champions in the division of the OBGC Capital Cup in early September. - Also, the boys won the EDP Fall South Atlantic Premier Division IV League. As a result of winning their league they will be promoted to the Division III League for the Spring 2019 Season. 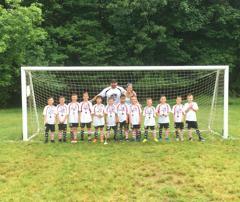 *PSC Prime BU9 – Won CMSA Division going 8-0, coached by Stephen Abey, Jennifer Crocetti, Craig Drenning. 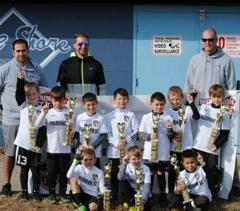 *PSC Prime Boys U9 took part in the South Hampton Cup the weekend of December 1 and 2. They played in the Premier top bracket, and took second, going 2-1-1. Out played Salisbury EDP Future team, to a 6-0 win. Goal Scorers, Nick, Dominic, Cory, Easton, Nolan = 2. Tied top team Coppermine Academy 1-1. Semi Finals – Beat FC United in a penalty Shootout 4-2. Finals lost to Coppermine Academy 1-0. Over all played a great tournament against tough competition in the state of Maryland, the coaches are very proud. To see pictures, go to "Around the Club" under the field status on PSC's homepage. Please support us (Pasadena Soccer Club) while shopping on amazon this Holiday Season. Remember to start at smile.amazon.com and choose Mountain Road Soccer as the non-profit. A few girls from the Stallings U12 and U9 teams went to the Blast game on Sunday, February 10. Hailee Stallings won a ball signed by the whole team! Her family was named “Family of the game” and received free tickets to the March 10th game. In Davidsonville this morning our U12 girls EDP team won their season opener 6-1 against A3!! Three goals scored by Ella Cieri, 2 goals scored by Kailyn Pledger, and 1 goal scored by Carlie Shoemaker! Yay Bulldogs! The Pasadena Soccer Club clinic program aims to promote a healthy environment, which enables each player to fulfill his or her potential, while promoting a fun environment. Players will practice once a week and professional trainers will be provided once every other week. Games will be played on Saturdays. The style will be 4v4 on a pug goal. We reserve the right to combine age groups, if necessary. Recreational soccer is our new expansion of our clinic program for those who want to continue to grow and want to learn the basics. This program will also be known as our intramural program and give children who are new to the game an option to compete at a fun level. The focus at the Rec level is on effort, skills progression, and good sportsmanship rather than the outcome of the match. Players will practice twice a week and professional trainers will be provided once every other week. Games will be played on Saturdays. Players may be asked to play on a county team if we do not have enough players to fill an age group. Parents have the option to sign directly up for the Rec Program. We reserve the right to combine age groups, if necessary. Recreational Plus Soccer is our new County Program. Teams will be combined of skill like individuals by try-outs held in mid-late May, by the lead coach of each age group. 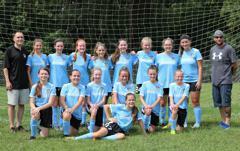 These teams will compete in one or two of the top divisions in Anne Arundel Youth Soccer Association League (AAYSA) in both the spring and fall seasons. Teams may also compete in one tournament a season. If your child makes a County team, they will be notified within one week of try-outs. If your child does not make a County team, they will be placed in our recreational program. Players must turn eight by August 31 of the current year to play in County Leagues. Players will practice twice a week and professional trainers will be provided once every other week. Games will be played on the weekends. The Pasadena Soccer Club Travel Soccer program is designed for the more dedicated soccer player and parent. Teams will be formed by try-outs, held by the lead coach. Travel players will be expected to commit to a more robust soccer program developed by each lead coach. Travel try-outs will be held in early-mid May. If your child makes a Travel team, they will be notified within one week of try-outs and will have 48 hours to accept the position. If your child does not make a travel team, they will be welcome to try out for our Rec Plus program. These teams will compete in travel leagues such as (EDP) ELITE DEVELOPMENT PROGRAM, (CMSA) Central Maryland Soccer Association, (CMSSL) Central Maryland Short Sided League, (BBSL) Baltimore Beltway Soccer League. This program may require long distance travel. Travel soccer will also compete in one or more tournaments per season. The cost of travel will also be greater to accommodate more tournaments, top of the line uniforms, bags and potential training. Players will practice two to three days a week and play games on the weekends. Not all age groups may have a travel team. Travel teams being fielded are at the discretion of the lead coach, skill and participation. 2001-2005 boys (grouped together because of smaller size). The application deadline will be 11:59pm on Friday, April 19th so if you are interested, please start working on it soon. Pasadena Soccer Club O's Night: A FEW TICKETS ARE STILL AVAILABLE!!!! FRIDAY MAY 10, 7:05 p.m. The 2nd Session of Futsal Leagues ended this past weekend at the Benfield Sportscenter. Congratulations, and Thank You to all the boys and girls for representing Pasadena this Winter at the Benfield Sportscenter. Another Strong weekend for our PSC Travel Program at another Elite Tournament. WOW! Another Strong weekend for our PSC Travel Program at another Elite Tournament. The Baltimore Mania Boys Tournament was this weekend in Columbia. This was an outstanding tournament featuring teams from Maryland, Pennsylvania, New York and even Boston! Dominant again. Played brilliantly. Boys were outstanding. They competed in the top division in their age group against the best teams in their age group. They fought hard and played their hearts out in the final. 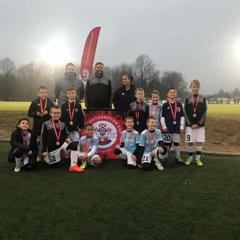 They finished as runners up, but played the top Pipeline team to their limit to the final whistle. The Revolution are really trying to challenge themselves this Spring. They will be playing up and age group against older boys and teams all spring. They started with this tournament. This is the first time they played in a highly competitive tournament 9 players vs. 9 (they play 7v7 in their normal age group). 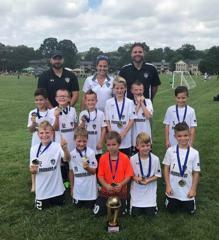 Their tournament started off rough losing the first two games, but the Revolution showed their heart and spirit wining their final match of the tournament defeating the CSA United Gold team 3-1. Pasadena SC Bayern continued to make a statement to the other teams in the area. 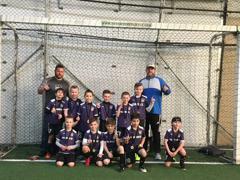 Beadling North 08 Boys (3-0) (This team is from the Pittsburgh Area). They fought hard and played for each other, their parents, and fans. 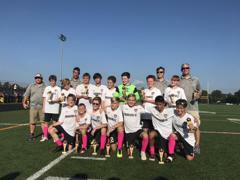 They finished as Champions, winning the final 1-0 against a very good SAC Premier White team. The game was end to end. The boys played their hearts out supporting each other both on and off the field. The game even included and incredible penalty kick save from goalkeeper Dominick Thatcher with 5 minutes left in the game. Throughout the weekend, I was able to watch every team play. Every player, parent, and relative should be very proud of our PSC Boys. You all played fantastic! Thank you all for representing Pasadena with your heart, skill, and sportsmanship. 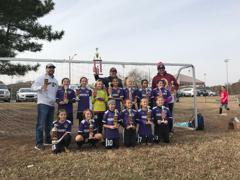 Pasadena Girls Travel Program will be represented ant the Girls Baltimore Mania Tournament Next Weekend by our Pasadena SC '07 Storm. Every. Single. PSC team that played on Sunday.... won! Bulldogs, Blast, and Bayern are all currently the leading scoring team in their respective division all three are also leading with goal differential. The PSC teams are dominating Benfield! Boys player agent or the Clinic Director.